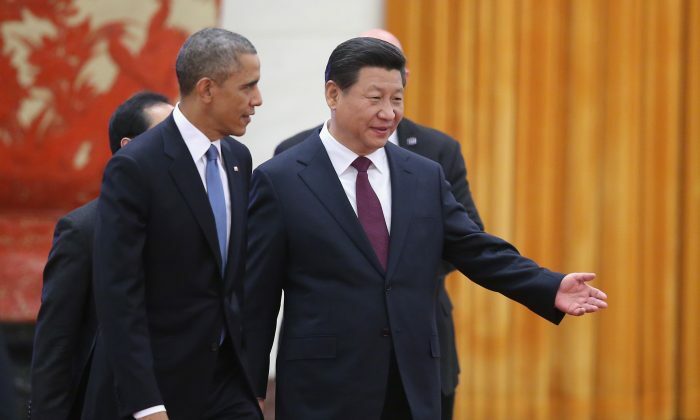 Xi Jinping, the leader of the Chinese Communist Party, will be meeting with President Obama on Friday, Sept. 25, and Chinese media is already making clear the message he’ll bring: Cooperation is important. Xi’s own remarks on U.S.–China relations also often have the centrality of cooperation as a major theme. While the notion of engagement and cooperation has always been the favorite topic of discussion in U.S.–China relations, there’s a good reason for China to emphasize this now. The Communist Party is facing immense pressure on multiple fronts, and it hopes that America won’t add to it, despite the enormous campaign of hacking of intellectual property that Chinese intelligence agencies have perpetrated against the United States. There has scarce been a more opportune time for the United States to apply leverage against China. A simple survey of the Party’s spheres of activity, both inside and outside China, shows how it has managed to alienate its neighbors, fail in managing a series of economic problems peculiar to China, anger a vast portion of its own people with persecutory human rights practices, thus undermining the trust in its own rule, and also exasperate the United States and other countries with general bellicosity or rampant theft of commercial secrets. The Party’s image is only starting to recover after the disastrous meltdown of the stock market in June of this year, the bursting of a bubble that had been pumped up by People’s Daily, the Party mouthpiece, which was encouraging retail investors to put their savings into the market as a patriotic duty. As the speculation got to unsustainable levels, the ratio of stock prices to the actual profits in the companies became detached from reality. The Shanghai Composite Index is now down 40 percent of its June 12 peak, lower than it was at the start of the year. For an authoritarian regime that ensures the populace that everything is in hand—just trust the state and don’t worry about politics—the crash was a harsh blow to Party credibility. Chinese people appear to have made a silent compact with the regime over the last few decades: economic growth in return for acquiescence to continued Party rule. The mismanagement of the market showed the Party’s fallibility to both China and the world in a high profile way. This year the regime has also embarked on a harsh campaign of repression against civil society, most notably with the massive, coordinated arrests of hundreds of rights lawyers around the country beginning in July. This security mobilization appeared to have been planned for some time, given its level of organization and extent. The Party seems intent on shutting down, once and for all, the class of professional rights advocates. Many analysts see this as being in the worst interests of the Party, though: rights lawyers are often the last safety valve for Chinese citizens who have drunk deeply of the injustice of the system, and the chance of recourse through the legal system prevents them from lashing out in less controlled ways. Many Chinese who have been persecuted have taken another route to make their voices heard: attempting to prosecute the officials responsible. The recent campaign by Falun Gong practitioners, a spiritual discipline that has been persecuted since 1999, is an unprecedented example of this. Since May, 160,000 Falun Gong adherents have flooded the Chinese Supreme People’s Courts, as well as the public prosecutor, with formal criminal complaints calling on the authorities to enforce their own laws against the former Party leader Jiang Zemin. Jiang initiated the persecution against Falun Gong, against the advice of other top leaders. He also happens to be Xi Jinping’s primary political rival, and the target of much of Xi’s intense anti-corruption investigations and purges over the last three years. The attempt to prosecute Jiang thus appears to have been handled with circumspection so far: frontline reports around China differ as to how local officials are dealing with the complaints. Some raid the houses of Falun Gong adherents and lock them up (though they have broken no law), while others even assist in helping file the complaints to higher authorities. Dealing with this flood of complaints offers Xi Jinping the potential to redress one of the greatest persecutions his Party has ever embarked upon—though doing so may ultimately also call into question the legitimacy of the Party itself. Added to Jiang’s lingering influence over politics in China, and the host of other pressures, the existence of a large, badly persecuted group calling for redress is another demonstration of the grievances that have built up in China over recent decades. Even comfortable, middle-class Chinese people had their sense of security stripped away with two explosions that blasted through a chemical warehouse in the port city of Tianjin, near Beijing, on Aug. 12. The enormous blast, which took place near midnight, destroyed thousands of vehicles and leveled nearby buildings, as well as shattering glass in high-rises half a mile away, such was the power of the explosion. Experts estimated that the blast had the power of 21 tons of TNT. Xi Jinping, the Party leader, himself was even unnerved by the incident, according to veteran political analyst Willy Lam, writing in Jamestown’s China Brief. His first instinct was to investigate whether the episode was a political plot, potentially cooked up by one of his enemies in the Party—the cronies of Jiang Zemin, for example, according to Lam’s deep network of sources in Beijing. Then there is the external environment: Party forces have angered maritime neighbors with a campaign to dredge up mud and sand to build islands, and then fortify them with military bases. The People’s Liberation Army navy is conducting these operations in international waters, and then claiming the territory as China’s, while attempting to prevent freedom of navigation in nearby seas. These operations have antagonized Japan, Vietnam, Philippines, and the United States. Incursions into disputed territory with India have also sparked tensions on China’s western border. This is the political configuration in China as Xi Jinping visits the United States: a slowing economy, ructions with neighbors, heavy handed repression, calls for redress for persecution spilling into the judiciary, and a leadership locked in a continuing struggle for primacy. These are the facts worth bearing in mind when U.S. commentators express reluctance at setting boundaries on Chinese conduct in cyberspace. In fact, there has scarcely been a more opportune time for the United States to apply leverage. Commentators say Xi Jinping may lack faith in the Ministry of State Security, a Chinese secret police agency. The sons and daughters of revolutionary Party leaders are coming out in support of China’s anti-corruption campaign, which targets in part former leader Jiang Zemin. Guo Yushan co-founded the Transition Institute, an underground socioeconomic think tank.